Two 5 Mukhi loose beads have to be soaked in a Glass of Water every night and water consumed first thing in the morning Beads are then kept in a bowl and left to dry who have blood pressure, and cholesterol related problems highly beneficial Good for health. 2 pancha Mukhi beads and (1) 14 Mukhi bead. 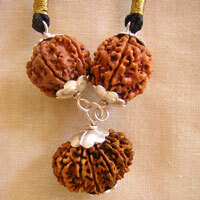 It represents Lord shiva in Kalagni Rudra from symbol of auspiciousness. 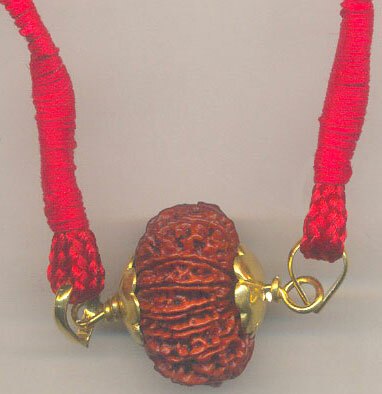 14 Mukhi Rudraksha is most precious DIVINEGEM – Devamani. It will awakens the sixth sense organ by wich the wearer foresees the future happenings. By wearing the Mala. It can avoid untimely death and Janma Janma Doshams. 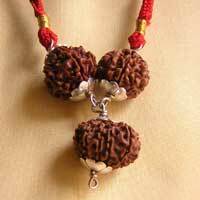 (1) 7 Mukhi rudraksha (1) 4 mukhi Rudraksha (1) 10 Mukhi Rudraksha 7 Mukhi Rudraksha represents Lakshmi Swarupam. 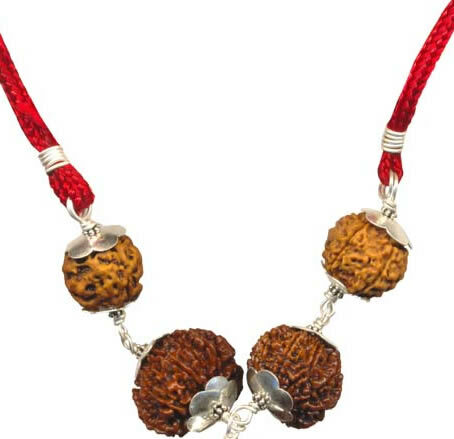 4 Mukhi Rudraksha represents Brahma Swarupam 10 Mukhi Rudraksha represents Vishnnu Swarupam. 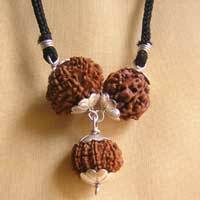 By wearing Narayana Mala Man can Progress in business or career and live life happily. It can be avoid Business loses & stability in business. 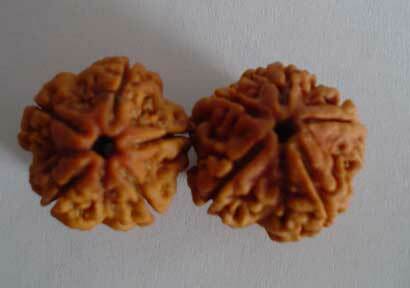 One 13 Mukhi Rudraksha & 2 six face Rudrakshas. It give riches and honourjand fulfils all the earthly desires. 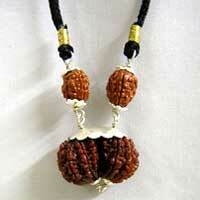 Kamedava Mala is helpful for Meditation and spiritual attainments and also causes material upliftment. Wearer enjoys all comforts at his command but still remains unahached. Kamadeva Mala gives all woridly pleasures happiness and luxury. One 12 Mukhi rudraksha and one ekamukhi Rudraksha(1 mukhi rudraksh) The wearer gets limitless administrative capacity he gets the Quality of the sun to rule and move continuously with brillant radiance and strength sun power mala can bring you power with luxuries confidance boost spiritual enrichment sun power Mala good for ministers politicians administrators Businessman and executives sunpower mala wearer can get good name & fame and he will lead luxuries life. Bramha& Saraswathi mala: (Saraswathi power Mala for students) This combination is made of 2 beads of 4 mukhi and 1 bead of 6 mukhi. It increases mental power concentration intelligence and focus it gives wearer wisdom learning and knowledge specially designed for scientists students and Research field people. 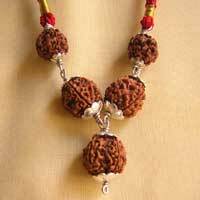 7 Mukhi Mala Lakshmi Swarupam, 8 Mukhi Ganesh Swarupam, 9 Mukhi Durga swarupam. It will increase good will power & dynamism Lakshmi Durga Ganesh mala removes wearer sadi sathi, obstacles, and brings wealth and prosperity. It will remove all Navagraha Doshams. 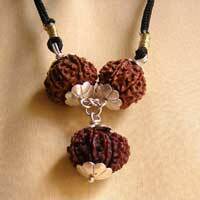 Gauri Shankar Rudraksha and (2) 2 mukhi Rudraksh’s This represents Ardhanareshwar. A combined from of Lord Shiva and goddess Parvathis. It blesses the wearer with unity. It brings peace harmony happiness and comfort in the family, this combination improves good marital relationship also used by couples desiring children.